In 2015 the Green is improved, with my Denon DB300F table (internally grounded), Vincent PHO-8 preamp, and there is no hum. I've used this for several years after tiring of the Audio Technica 440MLa and its piercing out of proportion highs. I highly recommend this for those who want audiophile quality, at a company set price of $95. Remember about these cartridges because you can go all the way to the best prestige stylus without replacing the cart. I picked up this Grado to use on my Rega P3 turntable but it hummed too much due to the internal grounding that the RB250 tonearm has did not match at all with this Grado. Conversely, with it on my Technics Q3, it grounds to the phono preamp and that eliminated any hum from the Grado and left me with and outstanding soundstage and natural sounding. With the right turntable, this cartridge makes my music sound so open, warm, and detailed! It replaced the AT95SE cartridge that I was using on my Technics Q3 that is tipped more to the treble side of things. Purchased this cartridge for $40 at Audio Systems in Austin, Texas. They are still one of the few remaining Audio showroom stores in Austin, Texas. Mark, the owner, is particularly helpful and friendly with all his customers. For $40, it sounds about as good as those $300 MC cartridges that I tried. Audible humming with Rega turntables that are grounded internally. This is for the Green , picked it up in the spring on a whim at a local retail store . First off it sounded good but hummed on my table , not real bad but I could notice it . I tried a few headshells and wires still had the hum . Switched it over to my Thorens 160 and hardly any hum at all ? I was taken by the sound , really smooth and musical . It has replaced a V15 IV with new stylus , just so much more engaging , can listen for hours . I also came into a new AT155LC that sold for $250 back when new and loved it at first , but after a month or so back to the green as my main cart . These are picky on set up and I fiddled a lot to get the sound right , numerous set-ups with various protractors but have it perfect. I have no inner groove distortion and the very slight hum is only noticable at 11 o'clock setting on the volume without the sytlus on the record . For the $62 cdn I paid it can't be beat , the stylus for my V15 was $90 US and the Green is to my ears much better .My next step will be the Platimum or Sonata .I also have a recently aquired Grado XT+ with a new Green stylus but it is not as good as the real Green , but shares the musicality of the Grado line . Bought this to replace the Audio Technica cartridge and stylus that came with my Teac P595 belt-drive turntable that I bought from J&R Audio back in the early '90s. I don't listen to my vinyl much anymore, but since it's now 2009, I just figured it was time to replace the stylus to prevent damage/wear to my LP collection. After doing some research on some 'Net audiophile message forums, it appeared the Grado Prestige Black cartridge was a good value since is provided 10Hz-50Mhz response, which was a wider range than the 20Hz-20Mhz range on the cart and stylus that came with the turntable. I found a Grado black prestige cart and stylus new on Ebay for $45, including shipping: that was too good a deal to turn down. Mounting the unit was a bit of a pain, but when I got it on and tried my copy of the soundtrack to "North by Northwest" (Bernard Hermann) it sounded so good! I couldn't wait to try out some of my other vinyl. Overall, very pleased with this purchase -- I wouldn't call myself an audiophile, but know good sound when I hear it -- this package makes my LPs really sound good! Bought this to replace the Audio Technica cartridge and stylus that came with my Teac P595 belt-drive turntable that I bought from J&R Audio back in the early '90s. In 2009, I just figured it was time to replace the stylus to prevent damage/wear to my LP collection. sounds very good and is cheap. 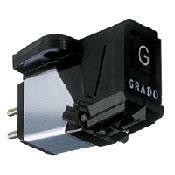 This is a review for the Grado Black cartridge. I have been listening to CDs for the last fifteen years since my then toddler daugther's little friend tried to "play a record" with my system without any vinyl on the platter. Somehow the needle ended up heading backwards and I just never bothered to fix it. I was hunting around for something in the attic the other day and ran across my old TT stored away in the corner. I pulled it out, dusted it off and assessed the situation. The old Shure cartridge that was on it is long discontinued, and a new stylus is about three quarters the cost of a whole replacement. I was never overly thrilled with the sound of the original anyway so decided to try something else. The tonearm is a two piece plastic job wired all the way from the pivet, with no height adjustment. I wasn't sure how well the system worked, so I didn't want to dump a bunch of dough on a new cartridge. A llitte research led to the Grado Black or Green as a possible good low budget choice. I bought a Grado Black and installed it myself. After pulling one of the connectors completely off the lead wire, I reassembled everything and set the new cartridge up as close to the position of the one it replaced as I could, hooked it up to my little integrated amp and tried it out. It sounded like the LPs were being played through a cardboard tube. A short cardboard tube. I listened for a while and figured that the turntable was crap, the phono section of the amp was crap, or both. It sounded nowhere near as good as my Cambridge Cd player. A few days later I decided to look at the little instruction sheet that came with the cartridge again to see if I missed something, and the only thing really in it was advice to make sure the stylus holder was parallel to the record surface in both dimensions. I checked the position of the cartridge and it was twisted on axis on the tonearm and the tonearm tilted up towards the front so the cartridge was popping a wheelie at the record, and not at all "parallel to the record surface. After rotating the mounting bracket slightly and shiming the cartrige to make up for the height which was significantly different than the original Shure, I had the cartridge more or less aligned with the record surface. Magic. The Grado now has a wonderful spacious and smooth sound. Any stringed instrument or voice sound particularly nice with this little budget wonder. The bass is a little tubby which might be due to the less than totally rigid tonearm, and the overall detail cannot rival the Cambridge Azur CD spinner, but this cheapo turntable with the Grado cartridge sounds very good and has caused me to get out and critically listen to ALL my old albums, which equates to hundreds and hundreds of dollars of essentially new music. I am happy and tapping my toes. Value, capable, tone rich, musical, lets you forget your setup and fuss of all the typical audiophile trappings and just listen to the music. Engaging! User replaceable cartridge. for 40 bucks it is almost silly to try and identify what it does wrong. Quite simply a fantastic bargain. I used this thing on my Clearaudio table after I couldn't afford to replace my big buck Clearaudio cartridge - and was forced to compromise. I installed it but had the overhang off and was disappointed with the lifeless sound. It was balanced enough but not the beautiful sound I had come to expect from my vinyl playback. After recent readjustment and fine tuning I have been absolutely engrossed with it. For 40 bucks new this is an amazing piece of work. Sure its not the perfect match with the Rega 250 tonearm as far as compliance goes but the sound is gorgeous. It brings out the absolute best in vinyl and the whole reason why we all listen to vinyl in the first place. I can literally listen for hours on end and be completely engaged. Make sure it is well aligned and matched well enough to your table and arm particularities but you will be surprised. I have found its sound to easily beat the Shure M97xe I have used as another affordable alternative cartridge. That grado sound I can't get out of my head.